Posting on the blog after a very long hiatus! Happy to be back here. 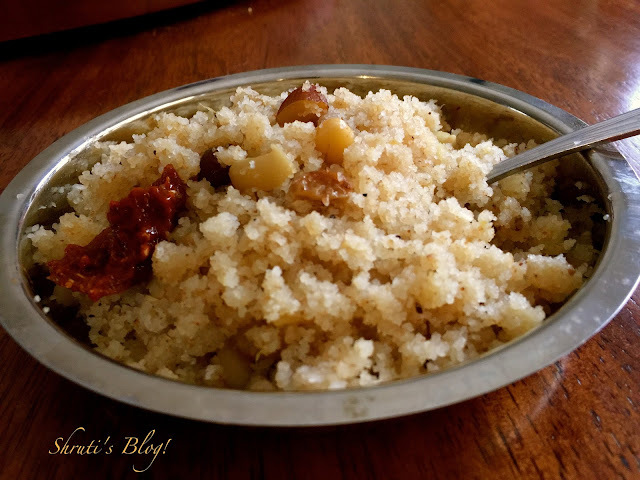 My lunch today was this sheera with limbacha loncha, a childhood favourite of mine. I click this picture, cleverly dodging the dog who is going berserk sniffing and afterwards continue to sit alone at the table relishing the warm sheera. Recently my daughters and I have talked about mindfulness and I want to practice mindfulness while eating. We hardly eat at the table, and never when alone. Eating without talking, reading, watching TV a unique experience. I pay full attention to the food, how it looks, how it smells, the muscles one uses to raise it to the mouth, the texture and taste of the food, the juxtaposition of the sweet and the sour, savoury pickle, the signals the brain sends to the stomach and vice versa. It’s these very attributes of food that create memories and magic. I can’t stay in the present for long. Out of habit, I think of how blissful it was for kids to come home ravenous from school to the prospect of this kind of “madhlya velcha khaana”. Another image that flashes in the eye of mind, is one perpetuated in popular Marathi literature– of a wife dutifully starting a cup of tea for her weary husband just before he came in from work – and, after taking away his “coat, topi and chatri”, proffering a steel tatlee or bashi of sheera served with a limb-lonancha to him. There is a brief moment of sheepishness on remembering that I used to be fascinated by this image of the wife, before I actually became one. Back to the present, the sheera – the taste, texture, aroma, flavours…. the dog (and me) so covetous, the flashing images, the sweet memories, the entire experience seems so corpulent. I am confused. This is not mindfulness - my mind harks back to the past. If focusing on one's awareness of the present moment while calmly acknowledging and accepting one's feelings, thoughts, and bodily sensations is not mindfulness, what is! The vegan version made with refined coconut oil and ripe banana was practically indistinguishable from its non-vegan counterpart, the Satyanarayanachya prasadacha sheera. In a thick bottom pan melt some of the coconut oil and lightly fry the dry fruit and nuts. Remove onto a plate. Then add the rest of the oil and roast the rava or semolina till golden brown. Add a pinch of salt. When the roasting rava lets out a nice aroma, add the chopped bananas and roast well. Then add the coconut cream and roast for a few more seconds until it is absorbed into the rava. At this stage the rava becomes very light and crumbly. Then add the boiling water and mix well. Add a little more water if you want the sheera to be soft. Cover and cook for a few minutes. Then add the sugar and mix well. Add the fried dry fruit and nuts and the crushed cardamom. Cover again and let the mixture cook well. Serve hot or warm. And don't forget that lemon pickle or limbacha loncha.